Ayanna Pressley is an advocate, a policy-maker, an activist, and survivor. She is currently a Representative in The US Congress for Massachusetts’ 7th district, becoming the first African American woman elected to Congress from Massachusetts. Her election to the Boston City Council in 2009 marked the first time a woman of color was elected to the Council in its 100-year history. This laid the foundation for Ayanna’s groundbreaking work, which has consistently strived to improve the lives of people that are too often been left behind. Raised in Chicago, as the only child of an activist mother who instilled the value of civic participation, Ayanna understands the role that government should play in helping to lift up communities that are in need of the most help. After her election to the Council in 2009, she successfully pursued the establishment of the Committee on Healthy Women, Families, and Communities. The Committee addresses causes that Ayanna has always been most devoted to: stabilizing families and communities, reducing and preventing violence and trauma, combating poverty, and addressing issues that disproportionately impact women and girls. Ayanna’s legislative achievements resulted in her being the top vote getter in three consecutive elections, making her the first woman in 30 years to achieve this distinction and the first person of color to top the ticket. 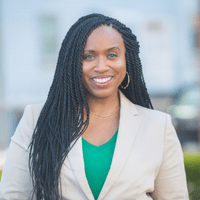 Prior to being elected to the Boston City Council, Ayanna worked as a Senior Aide for Congressman Joseph P. Kennedy II and later Senator John Kerry. In 2016, Ayanna was named one of The New York Times 14 Young Democrats to Watch. In 2015, she earned the EMILY’s List Rising Star Award and was named one of Boston Magazine’s 50 Most Powerful People. In 2014, the Greater Boston Chamber of Commerce named her as one of their Ten Outstanding Young Leaders, and the Victim Rights Law Center presented her with their Leadership Award. She is also an Aspen-Rodel Fellow in Public Leadership, Class of 2012.